This Olive and Cooking Oil Dispenser Bottle of 1 Liter size is the essential cooking and salad preparation mate. With its larger than normal capacity, you're much less likely to run out of that last bit of oil you need. This 1000 ML oil dispenser is drip free and has a vented rubber stopper and a recessed spout. Excess oil drips back into the container, rather than down the outside. The oil pours from the spout in a thin stream, giving you ultimate control over where and how much oil you dispense. The stopper removes easily for refilling the container, yet stays firmly in place. 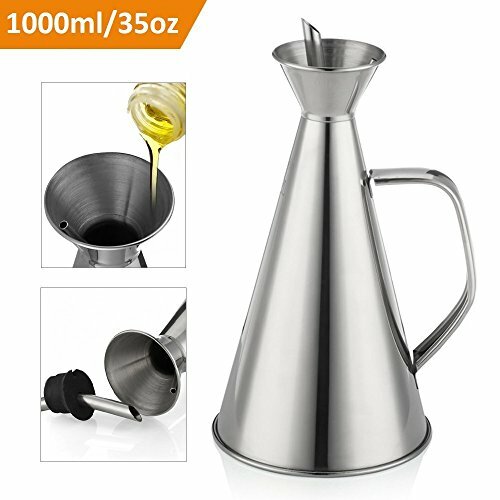 Made of stainless steel and beautifully polished to a mirror finish, this functional, elegant olive oil dispensing bottle is a great aid to your cooking or a really helpful gift for chefs! POURS A THIN STREAM OF OIL GIVING YOU PRECISE CONTROL. The nozzle with a silicon cover provides drip-free pouring. There's a vented rubber stopper with a recessed spout. The excess oil goes back into the container. CONVENIENT AND EASY TO CLEAN. 1 LITER (35 FL. Oz). Double the capacity of normal oil dispensers. 10 inch height. Base Diameter 5 inch. STAINLESS STEEL. DURABLE, RUST PROOF, AND DRIP FREE. Funnel head, easy for refill. An essential cooking tool and an absolute time saver for frequent salad preparation. SIDE HANDLE FOR EASY GRIP AND CONTROL. Cone shaped with beautiful mirror finish, sturdy, and non slip. Removable cork. If you have any questions about this product by Cuisica, contact us by completing and submitting the form below. If you are looking for a specif part number, please include it with your message.